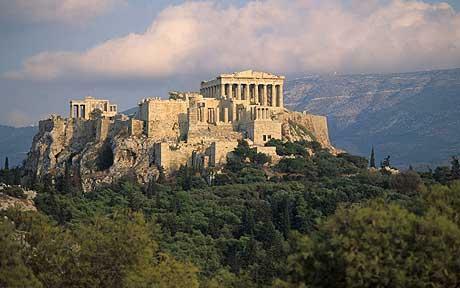 Athens is the capital of Greece, and the most populous city in the country. Its history spans over 3000 years, making it one of the oldest inhabited cities which are known. It was a mighty world power in its time, and a major cultural center. Here came out of great philosophers, writers and artists. Although today is experiencing a difficult time, its monuments and classic buildings last forever. The Acropolis of Athens is the most representative and known throughout Greece. It is located in a strategic place, first was in the upper to fend off enemies, and also from that privileged position without problems could dominate every corner of the city. Given its height, 156 meters above sea level, it can be seen from many parts of the city. The Acropolis contains some monuments of ancient Greece: The Parthenon, Propylaea, Erechtheion, and Temple of Athena Nike. While it is true that the Acropolis is quite shabby, with a little imagination you can imagine the moments of splendor of the city. The Parthenon, located inside the Acropolis. It was built for the goddess Athena Parthenos, and is one of the major temples in Doric building. It is built of white marble from Mount Penteli and was created to accommodate the image of gold and ivory of Athena Parthenos. Unfortunately this monument has suffered major damage throughout history. It housed a Byzantine church, a mosque, also used it shifts, the British plundered much of the decorative details. To make matters worse in 1894 was affected by one of the largest earthquakes in the history of Greece. Ancient Agora of Athens. It was the center of social, political and commercial life. Both meetings were held, such as elections, political debates … If you have seen Amenabar’s film “Agora” you know what it is about, because it portrays very well. Another of the temples to see in Athens is the Temple of Olympian Zeus. It was a magnificent temple in honor of Olympian Zeus. Average 96 meters long and 40 meters wide made of marble from Mount Penteli. As curious information we will tell you that the construction lasted 7 centuries, for different reasons. As always and it does not lose the habit fostered an earthquake that destroyed most of the temple, and only few remains. One of the most known is the Plaka, also known as the Neighborhood of the Gods, because of its proximity to the Acropolis. It is very touristy, and also retains its antique look thanks to the narrow cobbled streets. It is also one of the best places to buy souvenirs or try Greek cuisine. The official language is Greek, but as is common in Europe also speaks English. As for the time of year to travel, Athens has a temperate Mediterranean climate, so you can travel in both summer and winter. For all this, Athens is one of the best places to travel!